Created, designed, and built by Nikolai Zykov in 1990. Height: 92 cm / 36 in. Materials: papier-mache, foam plastic, foam rubber, wood, metal wire, fabric, foil. The second name of this vignette is "The Light of Truth". First presentation - November 23, 1990, Concert Hall "Vremya", Saint-Petersburg. WANDERER - transforming marionette of old man into young boy which is created according to the themes of Russian philosophic painter Nesterov and is based on elements of Russian, Oriental and European philosophy, but everyone can understand it in one's own way. The Wanderer is a puppet with a several difficult tricks. Step 1: The Old man finds a magic book. Step 2: The Old man opens and reads the book. Step 3: The Old man finds and puts on a magic mantle. Step 4: The Old man transforms into a Young boy, walking-stick become a flute. Step 5: The Young boy plays on flute. 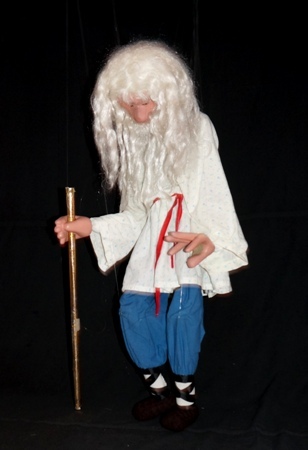 At present you can see the Wanderer in "The Magic World of Marionettes.